Okay, so I'm finally getting the hang of this new page. I had to redesign my whole layout because it wasn't looking well and build from an existing one. If you have any comments, suggestions or whatever, send fan mail here. Visit my site of webrings for maximum fun! Welcome to musicapocalypse, a website dedicated to empowering and uplighting marginalized voices within the music community, particularly with a focus on minorities. This website was built due to the web host's realization of the lack of diversity within the industry. This website is NOT a place to bash other sexes, races, other ways of life, etc. It is simply a way to give a platform for unrepresented voices within the music industry. I hope that my site bring you joy, hope, and inspiration! Thanks for viewing! New layout along with interviews are headed your way! Band of The Month is a feature dedicated to the band of my choice. For March, I have picked Veruca Salt as the first female orientated band to spotlight. 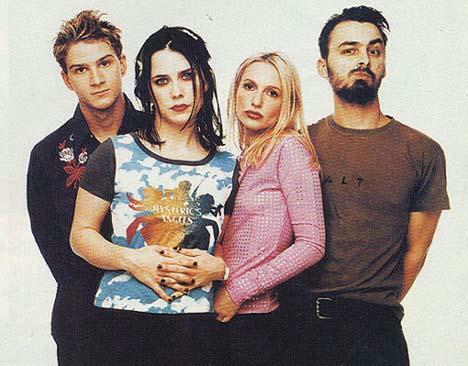 Veruca Salt is an American bases alternative/grunge band hailing from Chicago, Illinois. They are most known for their singles "Seether" and "Volcano Girls". You can visit their website by clicking here .